August 11, 2014 August 10, 2014 ~ Craig M.
It’s the drums — the hollow, ringing sound of a hand drum and the percussion of what sound like a half-dozen found implements. Not just that, it’s the sitar-like sounds, produced by Jed Brewer’s custom-made guitar that has a gourd for its body and a raised wooden bridge for that twangy sustain. Or maybe it’s just the name. 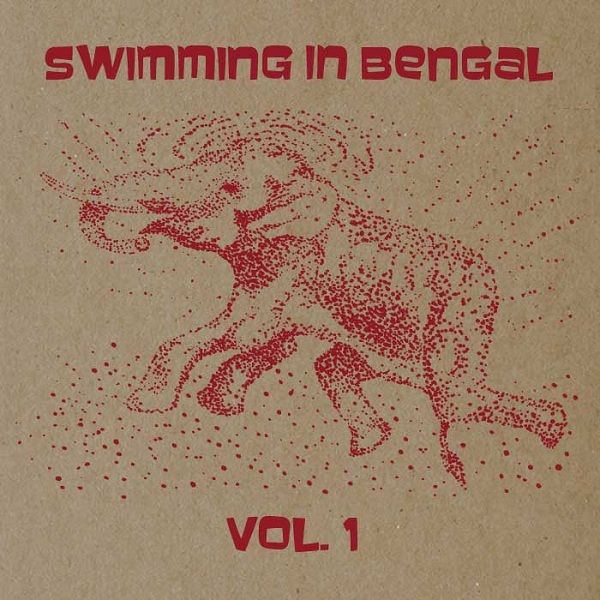 Swimming in Bengal feels like a mashup of Indian music, “world” music percussion, and King Crimson-style improvisation. The kind of improvisation where long, held guitar tones create a backdrop at once droning and alive. The mix of styles builds grooves and improvisations to get gloriously lost in. Vol. 1 gives us three doses of the band, each track speaking that raga-like language for nearly 20 minutes, but with different accents. “Slow Burn,” contrary to its name, turns into a forceful, strumming guitar jam. And “Scattered” uses aggressive sax to suggest a jazzy sound, where Alex Jenkins‘ drumming has almost a swingy feel — only to settle back into the psych-jam exploration of a Brewer guitar solo. The band is a trio of players active in Sacramento’s jazz/improv scene: Brewer; Jenkins on tabla, drums, and who knows what else; and Tony Passarell on saxophone, flute and percussion. Passarell is the band’s wild card. On “Walking Alone,” Passarell waits several minutes before he starts drawing lines in the sandbox, beautiful and fast-fluttery. In a way, the sax is an alien voice brought into this world-jam world — and yet, it’s perfect, adding just the right tint. The effect is a bit like the John Lurie National Orchestra: one saxophone carving out lines of melody that seem untethered and free but are actually working within the geometric knitting of the percussion and, in this case, the sitar-like drone. Passarell’s voice and personality on the sax differ from Lurie’s of course; I’m just referring here to the skeleton of the music. Passarell gets more of a lead voice on “Scattered” — and then, on “Slow Burn,” his soprano sax is the cathartic climax, stepping in a the height of a rock-jam phase, leading to a final few minutes of sunburst jamming. Swimming in Bengal is one of several projects Brewer is involved in. Find out more on the Lather Records blog; read about this particular band in the alternative weekly Submerge (pages 12-13); and check out the album on Bandcamp. also, talked to t.h.b and he may route thru palo alto: thanks for the tip.